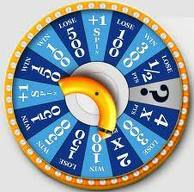 Play the Kraft Noodlette Game to win coupons for Kraft Mac N' Cheese. You play unitl you win! This is what I won! 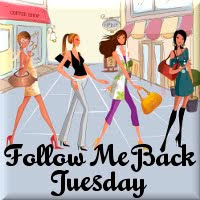 It's time for Follow Me Back Tuesday! This is a great way to gain new follwers and meet new blog friends. All you have to do to join us is follow all 4 hosts and the guest host for the week: Survey Junkie, Little Yaya's,Review Retreat, Boobies,Babies,& A Blog, and Still On The Verge. Then, you grab their buttton to add to your FMBT post, and put it on your blog. Go back and add your FMBT post to the link. (You only have to add it once.) 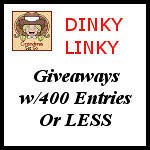 Make sure you leave everyone a comment to let them know that you have stopped by to follow their blog so that they know to follow you back. Have y'all heard the news? Bath & Body Works is ready for Halloween. They have the cutest Halloween items in stock right now. They even have some merchandise for Autumn available. Right now their Fall Candles are only $5! Their PocketBacs, which I really like, are on sale 5 for $5. Their handsoaps are 5 for $15, or 7 for $20. There's something about their handsoaps that make people want to wash their hands more often, (so don't forget to put a rubberband around the soap pump,hehe...) So, y'all go check out the Bath & Body Works Spook-tacular Boo-tique. 1) If you could be a fugitive from the law, for whatever reason, what would your crime be? (from It's a Hooah Life) I would be a fugitive from the law for stealing a yacht and sailing away. 2) How long do you think you will be a military family? (from Julie the Army Wife) We will be a military family for 11-21 more years. 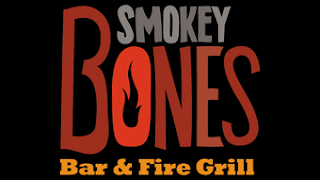 3) What's your favorite recipe? 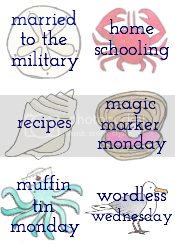 (from Keep Calm and Soldier On) It's really hard to choose just one favorite recipe. I do like baking and cooking my family's favorites. Those recipes would include sugar cookies, Thai Red Curry, and homemade pizza. 4)What would you want your last five words to be when you leave this life? (from My Goal is Simple) I'll be waiting for you. I am hopping on the Tuesday Train! If you want to hop on the train with me; here's what you have to do. Follow the hosts, Christy over at I'm Just Sayin', and Cari from This Little Family. Add their button to your blog. If you just link to your blog, post their button in your side-bar. If you link directly to your Tuesday Train post, then post it there. As a courtesy, follow the person before you, and after you in the link-up list. Last, but not least, have fun! 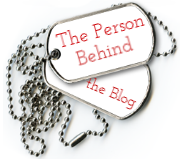 This week I'm linking up to Wife of a Sailor for MilSpouse Friday Fill-In. Every week she posts 5 questions for military spouses to answer, so that we can learn more about each other. 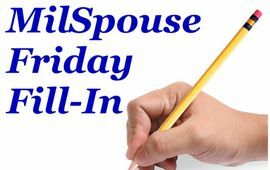 After you answer the questions, make sure you go back to her blog and enter the link to your Milspouse Friday Fill-In. That way we can visit each other. Okay, here are the questions this week, and my answers. 1) What is ONE thing you would like civilians to understand about being a military family? 2)What is your favorite mistake? This will probably sound cliche', but I am going to have to say...our son. 3) What indulgence could you give up for a year? This one is easy. I have not be "allowed " to have caffeine for several years. At first it was really hard...think chocolate. Now, it's just life. 4)If you could be a winged animal, what would you be? I think I would be an owl. Eating little mice sounds gross, but if I were an owl I would like those, right? 5) What is one question you would like to see asked in a future MFF? Hmmm...how about...Even though you don't like it when your spouse is away, what is one thing you look forward to doing that you don't/can't do when they're home? Okay, that's it y'all...go join in and link-up! Have fun! If you like Philosophy, you'll like this. 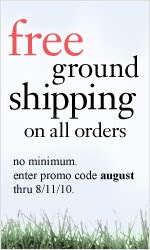 For the next two days you can get free ground shipping on your order. There is no minimum purchase. Christmas is coming up, and their products would make great gifts for some people on your shopping list. 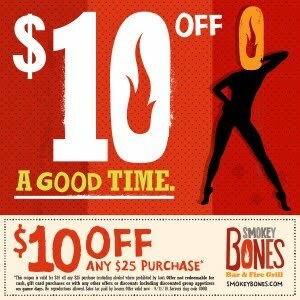 They also have a give-away you can enter to win one of ten eternal grace gift sets, plus a $100 e-gift card. Also, if you sign up to receive their e-mails, you'll get a free gift. Click on over! Go Here to sign-up for a free sample of a Green Genius: Biodegradable trash bag. I haven't received mine yet, but I've heard great reviews about these. It's time for Follow Me Back Tuesday. All you have to do is follow the hosts: Survey Junkie, Little Yaya's, Review Retreat, Boobies,Babies,& A Blog, and their guest host of the week , Let's Just Give it Away. Leave them a comment to let them know you're following them. (They will follow you back.) Then, post their button on your Follow Me Back Tuesday blog post. Link-up your blog. (You only have to add it once.) Then, follow as many blogs as you like. Leave comments on their pages to let them know you've been there. It's a great way to meet new blog followers and friends. Have fun! This morning I read a remarkable story about a woman named Donya. Donya has Down's Syndrome, and when she was born her mother was told she would never walk,never talk, or never even be able to use to toilet. They were also told that she would never live past 20 years of age. On August 18th Donya will be celebrating her 50th birthday! 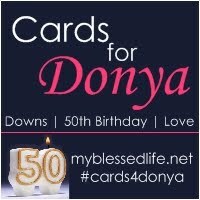 Please go over to Myra's blog, My blessed life , and read more about Donya, and find out how you can help her celebrate her birthday. This is truly a remarkable woman. 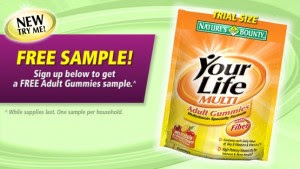 Nature's Bounty is offering a free sample of their adult gummy multi-vitamins, and a free pedometer. Just go here to sign-up. The free pedometer is listed in the left side bar. You'll have to sign up for the two items seperately. I've gotten samples from them before, and they have always come as promised.